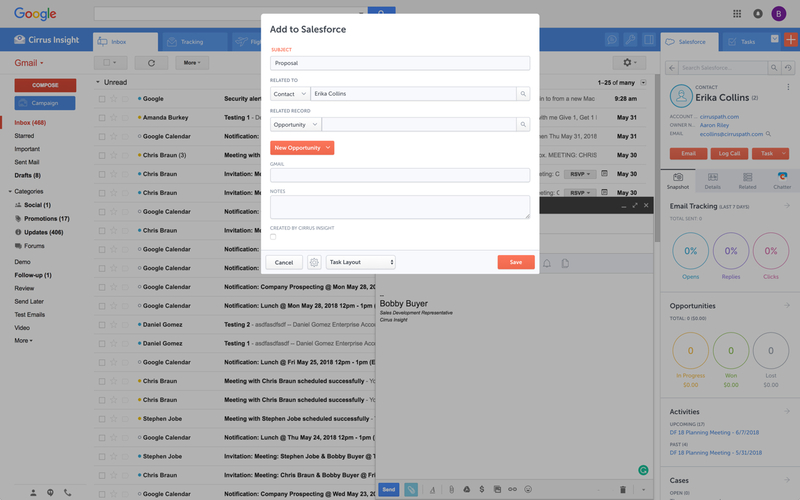 Review: "Cirrus Insight good for logging emails to Salesforce, and editing records quickly from your inbox view"
Some other sales departments used Cirrus, too, but I did not work with them on it. We eventually chose to scale our Cirrus use to 180 global sales reps.
Log email to Salesforce. You click one button and it logs for you. This is easier than adding the BCC email address that Salesforce provides as a way to log email. Track views and engagement on these emails. It's nice to know if the email was opened and if links were clicked. Update quick fields in Salesforce directly from their inbox using Cirrus. This prevented reps from needing to click into Salesforce, wait for it to load, then update fields like the phone number or name. If the rep did need to open Salesforce, Cirrus provides a quick button to navigate to the Lead/Contact/Opportunity page quickly. Cirrus would often mysteriously stop working. Our Internal Business Tools team found it difficult to provision users correctly during onboarding. Another reason Cirrus often stopped working was because you needed to clear your cache in Chrome. We needed to perform this step for each user at least once per quarter. Organizations with high tech proficiency so you can easily troubleshoot and learn how to use a tool that offers many settings. Cirrus Insight Review: "I don't know why we pay for this." We use Cirrus Insight for email tracking, connecting email with Salesforce, and some campaign work. I can't think of anything that it does really well. The Salesforce link often doesn't work - I don't know if that's Cirrus or Salesforce, but Cirrus gets the blame in my mind. This means that either we duplicate work in the sales>customer success handoff by consolidating communication information OR we lose it. Losing it is easier, so it's what happens more often. Building campaigns is painful - the integration with Salesforce requires a significant amount of back-and-forth work. If my contacts were better linked or it could be done in fewer steps, I may have a different opinion. Tracking doesn't work consistently. Between being sporadically tagged for tracking (doesn't work automatically) and losing the tracking mid-exchange (subsequent emails can be untracked), I might as well just not have it at all. If we were a more email-centric sales team, I expect I would know more about the software but I've found it unintuitive at best and obstructive at worst. Successful implementation of the tool also requires that you set standards within your organization so you can easily transfer knowledge. Cirrus Insight Review: "Best Gmail-Salesforce integration I've tried"
I used the Gmail version of Cirrus Insight for about a year and a half, and overall it's a solid product. I previously used a competitor and my experience with Cirrus was much better. The tracking works well and the automatic logging of activities to Salesforce was a big time saver. It was also great to be able to see all of my contacts from Salesforce showing up directly in my Gmail sidebar. The only drawback I noticed was that the UI could be a little cramped on small screens when changing the record that the email would log against (say, a Case rather than a Contact) or case creation. So it could be a bit of a challenge when traveling and working on a laptop. But for working on a desktop machine with a good-sized monitor, I definitely recommend it. Anyone who sends and receives a lot of emails and works primarily out of Salesforce can see good benefits from Cirrus, especially if your company follows the motto of "If it's not in Salesforce, it doesn't exist." On my heavier days, it easily saved me half an hour of manually logging all my emails. It's also useful if you need to track opens, link clicks, and attachment downloads. Cirrus Insight Review: "A Great Solution to a Pretty Big Problem"
Cirrus Insight started being used by our whole department about a year ago. We started investigating ways in which we could directly link our Outlook email system to our Salesforce system. We had been using the free email to Salesforce option, but found it clunky and not very useful at the time. What's great about Cirrus is that you link emails to particular contacts, organizations, projects, and other files/records that you and the organizations might have created yourself. It's very fluid in that way. It can also include any email attachments (you just have to select a checkbox, it doesn't do it automatically). So, it became a great solution to a problem we have been encountering for years. However, in the last month or so, I have removed any Windows users from the account due to technical glitches. As a Mac user, I had many technical glitches as well, but they seem to have been resolved. Theirs are still pretty ongoing- downloading it as an add-on into the Outlook system really messed with it overall and our IT manager didn't recommend it. Therefore, they have decided to revert to the free email to Salesforce option (which apparently has been improved). Clear, clean interface and very easy to use for any type of user. Can customize according to your Salesforce needs. Any Salesforce updates are immediately connected to Cirrus. No waiting for sync. Outlook for Mac could use some work as an add-on because it's hard to read sometimes on my laptop. It's not a sidebar, like the Windows functionality, so it's harder to read. Doesn't always find an opportunity, even though I know it's in our Salesforce system. Randomly shuts down and doesn't log in properly at times. I've had to remove and re-download more than once. It's well suited if you're a Windows user. They're still working on the Mac updates. It's very helpful if you want to integrate more of your emails into your Salesforce system and want to capture all of that more accurately. For our organization, capturing conversations and documents is very vital, so it made a lot of sense. We're a small team and it works well for us, but I think it could work just as properly for a larger team too. It's less appropriate if you don't really care about the email to Salesforce functionality or haven't really thought about it before. For us, it was a huge gap and need and it really addressed it. Cirrus Insight Review: "A must have for sales teams!" We use Cirrus Insight throughout our sales team. This intuitive tool helps keep our sales team efficient and active in their inbox and client engagement rather than hopping between email and Salesforce. 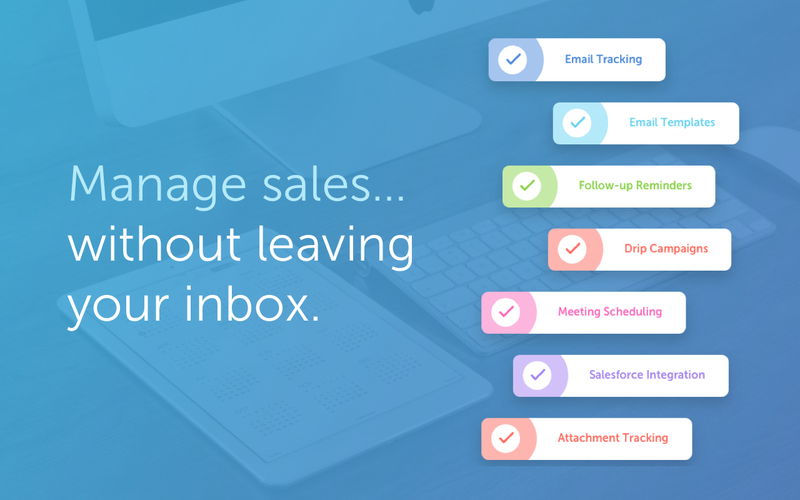 Sales reps create and update leads and opportunities without leaving their inbox. Schedule follow up tasks and client meetings from our inbox. I love the Cirrus tool, however, feel as though I have only scratched the surface of functionality and value it could bring our organization. Easy tutorials would be helpful. Some minor bugs lately where saving email timed out. I believe Cirrus Insight is a must have for sales teams of all shapes, sizes, and industries. If your sales team has email and a CRM it is a must have if you value data integrity and sales activity being captured in your CRM. Cirrus Insight Review: "Use Cirrus to make use of your database!" Regular Salesforce users for fundraising and program at BioBus use Cirrus to easily connect our Gmail and Salesforce. Through Cirrus, we can see Salesforce data and save emails to Salesforce all within our inboxes. It's a huge timesaver and easy to use, so it facilitates actually getting the data into Salesforce. Easily sync email communication to Salesforce from your inbox. See data in Salesforce within your inbox. Add tasks, phone calls, and other items to Salesforce from your inbox. The layout doesn't always match edits made to the Salesforce layout and can require customization. Some related items in Salesforce display as the reference number instead of name in Cirrus. Mobile version is not nearly as user-friendly and is a bit cumbersome since it's not built into Gmail. Cirrus is a great solution if you want to make it easy for users to access Salesforce (for both viewing and adding information) from their inbox. Doing this is a great way to see your database actually be used and see results from that. Cirrus Insight Review: "Cirrus is still buggy and will cost you Customer dissatisfaction"
It’s a great solution for logging emails into Salesforce, but their service is very slow, and they’re still debugging this product even after 5 years. My client located in Miami scheduled an appointment with me and got a Madrid time zone Calendar item. We checked her calendar setting and it was on EST correctly. Another client in India was able to schedule a Sunday meeting with me, whereas my calendar does not allow for that to happen. Review: "Cirrus Insight for Serious Contact Management"
Cirrus Insight is being used primarily by our Regional Representatives, who use it to add project contacts to our Salesforce. It simplifies and expedites the process of adding new contacts and their company in one easy step. They also use it to track new opportunities and document cases. User friendly interface right in your mailbox. Easily record e-mails and attachments to a contact, opportunity or case. 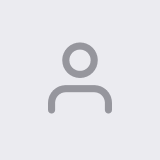 Create new accounts and contacts in one step. It seems to “break” periodically, which is sometimes hard to diagnose for non-IT users. Would love to be able to attach emails to multiple locations at once. If your users are field based, Cirrus Insight offers a mobile app, which our users love. Because of this tool, our Regional Representatives are finally inputting valuable contacts and interactions into salesforce. Cirrus Insight Review: "Lets me stay in Gmail while updating Salesforce"
Our sales team uses Cirrus to stay connected to Salesforce while being in Gmail. Brings up important information about each contact when I'm in Gmail. Makes it easy to create new accounts, contacts, and opportunities. Regularly asks me to upgrade to a "new" version even though I'm already on that version. A bit of a hassle. Doesn't play well with other plug-ins. I also use Nova.ai and sometimes their formatting gets messed up when both are installed. Makes it easy for me to live and breathe in Gmail while staying connected to Salesforce. If I get a new email from a prospect, I can create the Account, Contact, and Opportunity in Gmail all with just a few clicks. Cirrus Insight Review: "An invaluable tool, but slows down browser"
Cirrus Insight is used across business units. There are a number of business problems it solves. For someone who uses both Gmail and Salesforce as part of their main role, this software is an invaluable connector for them both. Some of the features are also not Salesforce specific - such as the Meeting Scheduler, which has proved invaluable to me, and I would recommend to any Gmail user who frequently set up meetings (either internally or externally). Cirrus Insight Review: "Cirrus - pretty good for email campaigns"
Cirrus is currently being used by the commercialization team which is incharge of sales. We launch email campaigns for specific technologies that we want to license and Cirrus is the tool we use to launch and monitor these email campaigns. Cirrus helps solve the problem of tracking the emails, number of opens, deletes, links clicked etc. Cirrus is really good when you have to launch and manage multiple email campaigns and when each campaign has around 100-200 emails that need to be sent. Cirrus Insight Review: "Salesforce Inbox done right"
We use Cirrus Insight to easily create leads in Salesforce and to interact with Salesforce data from our Outlook inboxes. This saves us time and energy and makes sure data is making it into Salesforce. We also use the calendar scheduling function and the open tracking features. This helps making scheduling meetings easier and to see if emails have been read. Easily add records to Salesforce using contact information from an email. Interact with Salesforce records in my email inbox. 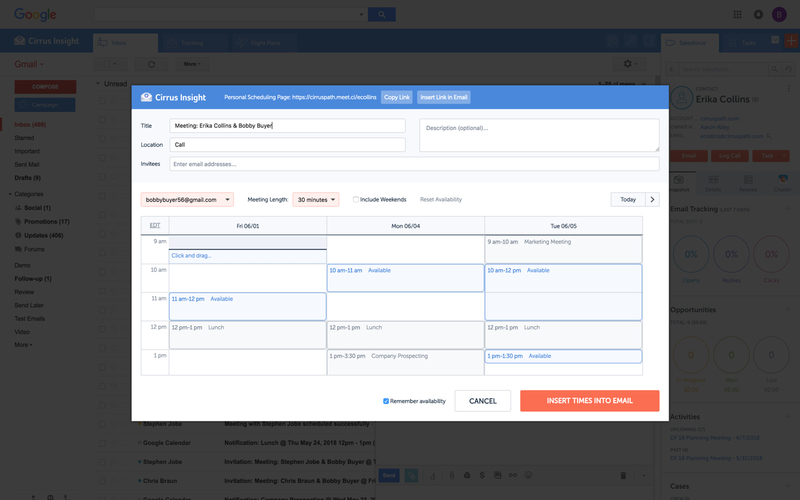 Easily schedule meetings with the meeting scheduling feature. I think Cirrus Insight is great. I'm not sure what I would improve. It's great for people who are regularly in their email inbox but need to interact with Salesforce data or create Salesforce data easily from their inbox. Cirrus Insight also makes it easy to log emails into Salesforce. It works both with Outlook and Gmail. Cirrus Insight Review: "Cirrus(sly) Awful"
The sales team uses Cirrus. We use it to log meetings and emails from Google to Salesforce. This function works okay. We also use it for automated email messaging, which is absolutely awful. The logging features work as they help track activity, but the email automation is clunky, often breaks, and we run into problems DAILY. For logging emails it's great. It's fluid and it syncs everything I send with Salesforce. IF all you're interested in is tracking emails, this tool works well. The flight plan feature is underdeveloped and doesn't work well/at all most of the time. There are much better options out there, I don't recommend. Cirrus Insight Review: "Simple tool with profound implications"
At Invaluable, I use Cirrus Insight for tracking and logging email. I also have it connected to Ambition in Salesforce to keep track of my email activity. It is primarily used in advertising, sales and account management to help us track email open rate and log emails to update into Salesforce. Perhaps Cirrus Insight can have additional features like logging calls. We use Tenfold for tracking calls and Cirrus Insight to track emails. So, for our organization, knowing when a client opens an email helps us in our qualification process of leads. "Cirrus insight Review - Cirrus is ok but needs work"
Cirrus Insight is used by our Sales Development Representatives and Outbound Account Executives to execute a couple of key functions within our business. The first is that we find it extremely helpful to log rep activity within Salesforce via the mapping feature. We also use Cirrus Insight to assist us with scheduling reminder notifications for emails that are not engaged with by prospects/current account contacts. Furthermore, there is significant utility in Cirrus Insight supporting us to book meetings and to manage delivery times so that emails are opened based on the time elected by the sender. The final way in which Cirrus Insight helps us is via the email tracking feature, which allows us to see when, where and what links were engaged with by recipients to allow us to further determine the best course of action in the sales cycle. Email Tracking is not always accurate - this can be due to the nature of the device and the email client used by the recipient. Gmail app is subject to being glitchy and auto-log out out behavior. Meeting time function is limited in its functionality and is prone to glitches as reported by clients. Send later function works about 85% of the time. Follow up intervals are too short and should provide more customised options. Review: "Cirrus Insight would be a great tool - if they could actually get it to work"
We currently use Cirrus for email tracking, attaching emails and activities to records in Salesforce, and creating contacts from our inbox. We use it company wide. If you use Chrome, the tool has essentially become useless as it constantly crashes and forces you to reload your Gmail multiple times per hour. The tool often glitches and forces you to uninstall and reinstall it multiple times per week. Their support staff is terrible and seems to think that all issues can be fixed by clearing your cache. It can't. And telling customers to download and use a different browser is extremely unhelpful. If it's not working in Chrome, fix the issue, don't just expect the user to completely change how they work and what they use so that you don't have to face the issue. Cirrus is great if you don't use Chrome, which most of their users use. Cirrus Insight Review: "It could be a great tool"
Cirrus insight is mainly used by an other part of my organization. I gave it a try as account manager on my own to see if it would be useful in my daily sales life. Be aware if you test it as it is hard to unsubscribe from their services. Make sure that it doesn't slow down your email client since we all spend a lot of time on it. Cirrus Insight Review: "A Must for Sales/Marketing People using Google Apps + Salesforce"
Being a small business, I wear a lot of hats, and any tool that can streamline activities and save me time at a reasonable cost is highly appreciated and valuable. In working with Cirrus Insight, I appreciate their forward-looking approach to their system as it has had small positive steps (syncing contacts and calendars) and huge leaps (templates integration, follow-up tasks/reminders and integration with custom objects) throughout my experience. It saves me a TON of time and makes my work life much more efficient. The ability for the 'smart email' integration in Gmail to continue to recognize the desired Object and Record to document the email to is fantastic as a time-saver and is appreciated by compliance. The reminders are one of my favorite new features as they help keep me from having to hop back and forth to SFDC. BIG TIME SAVER. Integrating my Google Calendar to SFDC is a real help, and it even does a good job of looking up the contact based on the email, something Appirio's tool never quite figured out. Email tracking is a great feature as well. Email tracking - I think they need to step up the UI for the tracking summary. I would appreciate if it opened into a separate page in addition to the in-Gmail app to provide greater insight to the opens and clicks. Tagging - I think it would be nice to be able to create a few custom tags and then add those to emails to make it easier to track just sales/service/marketing emails. I think the next level for them will be to have some tracking code we can put on our website to see how our emails are leading people to review information on our site. Different roles have different benefits to the use of Cirrus in our organization. I have not expanded the use of Cirrus as much as I would like and it would be helpful for Cirrus to create some fact sheets on how they might benefit different roles in an organization (Customer Service, Marketing, etc.). Cirrus Insight is very user friendly, I love that it syncs directly with my Salesforce account, so I am always on track with each account that I'm working on. It's great that the program is integrated directly into my Gmail account, making it easy and efficient for me to log my emails. Cirrus Insight is suited for sales or customer relation positions. "Cirrus Insights is the Best App for Integrating Google and Salesforce"
If you are looking for a way to integrate google apps and salesforce, this is the single best tool available on the market. For the price at which it is being offered, it will pay for itself in just a few days. You will become more efficient using it, and that extra time saved will make you more profitable as well. Review: "I'm Serious - Cirrus Insights is a must have for any sales professional using Gmail and Salesforce"
Cirrus insight is used by everyone that interacts with Salesforce, which are primarily our sales, marketing and customer success teams. I've also used it in my previous two sales roles and I cannot imagine using Google Apps and Salesforce without it. The major problem that it solves for me is logging activity into Salesforce and attaching to the relevant opportunity. Also, I find it much faster to add new contacts from within Gmail through Cirrus Insight. The tracking features are also quite useful and I've found "false flags" are much less likely than I previously experienced with tracking email links through Eloqua. Logging activity to Salesforce from Gmail and Google calendar. The integration is seamless. Scheduling follow-ups before I send the email. 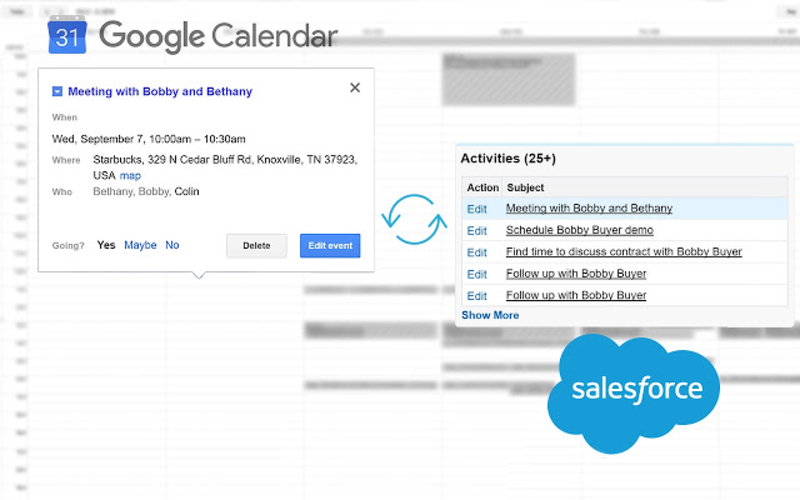 It also automatically logs a follow-up event in Salesforce. Tracking opens provides useful insight. Completing and creating tasks with the Cirrus Insight sidebar in Gmail is very convenient. I've found the email tracking is not always accurate, especially when sending an email to multiple recipients. It would be great if it could track multiple recipients individually. Logging activity to multiple contact records in Salesforce when sending to multiple recipients would be a beneficial feature. Sometimes it crashes/freezes up, but I'm not sure if that's a Gmail or Cirrus Insight problem. Cirrus Insight is most suited for sales professionals communicating via email. Especially, those in outbound prospecting roles. There's no excuse not to log your activity in Salesforce since it's as easy as clicking a button. Cirrus Insight is a plugin for Gmail and Outlook for salespeople. The vendor says it's an all-in-one sales productivity platform with world-class Salesforce integration. 250,000 people use Cirrus Insight and its sister products Attach.io and Assistant.to to work faster and smarter from the inbox and calendar. Cirrus Insight was ranked #41 on the Inc. 500 list of fastest-growing companies in 2016. Pricing based on annual billing.